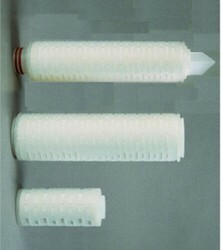 We offer ER Nylon Filter Cartridges to our customers. The products offered by us are manufactured using optimum-grade raw material that are obtained from authentic vendors of the industry. The material used in the production process is sourced from most trustworthy and reliable vendors of market. Melt-Blown Technology is a significant innovation leading today's filter industry, although the filter produced by conventional melt-blown fibers apt to exhibit some limitations. As a recognized name in the industry, we are offering an exclusive array Nylon Depth Filter Cartridges. Type: Wound, Spun, Pleated, Resin Bonded, Sintered, mesh, coalescing. MOC: SS, Polyproplene, Polyster, Cotton, Glass Fibre, Rayon, Nylon, membrane, felt, Ceramic, Carbon, cellulose and resin impregnated paper etc.